White-bodied with a brown head, these C-shaped larvae attack the roots of your grasses and ornamental plants, cutting off nutrients and causing damage. 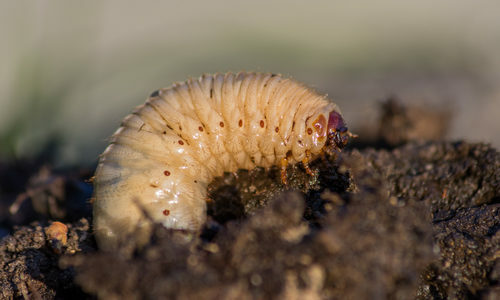 White grubs are the immature form of various types of scarab beetles – so, once they grow into adults, they will emerge from dirt to reproduce and cause an even bigger grub problem. At first, the oddly shaped patches of grass whose roots they feed on will turn gray-green and wilt. If the feeding continues, the turf will become spongy from their tunneling and attract skunks, raccoons, opossums and moles. Grub worms open the door for many pests and problems if not treated quickly and correctly. No, white grubs are not inherently dangerous to you or your family. However, if left unchecked they will not only attract other pests that use them as a food source, they can cause hard to repair damage to your lawn, garden, and potted plants. Why do I have white grubs? It’s likely a combination of two things: nearness to another area that they’ve already made their home and an ideal environment. All they’re looking for is moist soil, so if your yard has some, it’s an easy place for them to settle in. How can I prevent white grubs? White grubs love moisture. They thrive in soil that possesses high levels of moisture, so a good way to drive them out if you have them or keep them out if you’re worried about them is by lessening the amount of water you use on your lawn. How can Gregory Pest remove white grubs from my home? An expert exterminator from Gregory Pest Solutions will be your full-service pest solutions provider specializing in the effective, humane removal and prevention of white grubs and their nests from your home or business. When you hire us to evaluate how extensive your home’s pest problem is, one of our pros will be sent to assess the white grub situation and then formulate an environmentally friendly plan for removal and prevention. Once we implement our plan, our experts will clean the area and seal any openings that are prime for future nests so you and your family can enjoy a lasting insect-free environment. Ready to get Started? Our technicians are ready to help rid your lawn of unwanted white grubs.